Alaskan Dream Cruises has announced three new itineraries, additional ports of call and ship renovations. Alaskan Dream Cruises is owned and operated by an Alaska Native family in Sitka, Alaska. The company will operate its second season from May through September 2012. 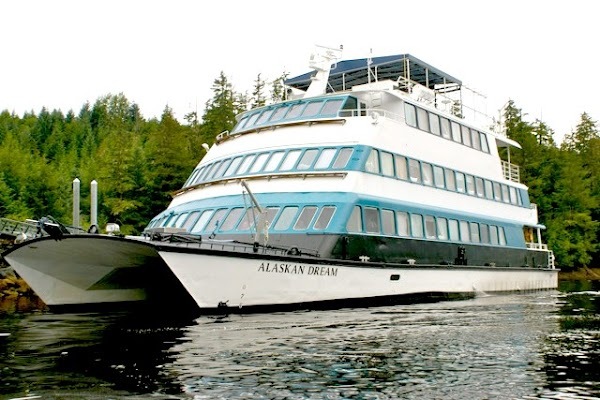 The 42-passenger Alaskan Dream will sail on three new itineraries in 2012: an eight-day trip that focuses on many less-explored destinations, including Hobart Bay and Kasaan, and two more comprehensive 11- and 13-day trips through the Inside Passage. The three itineraries also include new ports of call for the cruise line: Ketchikan, Skagway, Haines, Thorne Bay, Kasaan, Wrangell and Gustavus. The new eight-day Alaska’s Inside Passage Sojourn itinerary travels from Sitka, a community rooted in Alaska’s Russian history, and ends in Ketchikan, a popular fishing and arts community in the area. In between, travelers are treated to the lesser known destinations of the Inside Passage. The village of Kake claims the world’s largest totem pole; visitors are greeted in Petersburg by children who perform a Norwegian folk dance; Kasaan is home to the only remaining Haida clan house in Alaska; Thorne Bay was once the largest logging camp in the world; and Misty Fjords offers glacier-sculpted cliffs that staff say rival the awe-inspiring scenery of Glacier Bay National Park and Preserve. In addition, Hobart Bay is an adventure base camp visited exclusively by Alaskan Dream Cruises, offering sea kayaking, all-terrain vehicle tours and small Zego sport boat excursions. Rates for the cruises begin at $2,269. The Alaska’s Southeast Explorer 11-day itinerary also traverses the waters between Ketchikan and Sitka, but expands the route to include the capital city of Juneau; Glacier Bay National Park and Gustavus, the small community that sits at the entrance of the park; Skagway, known for its gold rush history; Haines a small fishing community with an expansive bald eagle preserve; and Wrangell, one of the oldest towns in Alaska. Travelers also spend an evening on Colt Island at Orca Point Lodge, which is available only to guests of Alaskan Dream Cruises and its sister company Allen Marine Tours, for an Alaska salmon and king crab dinner. Rates for the cruises begin at $3,399. The 13-day Alaska’s Glacier Bay and Inside Passage Voyage follows a similar route as the 11-day cruise, but spends additional time off the beaten path. Guests explore Windham Bay from a private wilderness retreat that offers fishing, sea kayaking and two-person outboard motor boats. A full day is spent whale watching and viewing other marine life among the Inian Islands and near Point Adolphus, a world-famous feeding area for endangered humpback whales. Guests will also visit Lake Eva near Sitka for a hike on a newly rebuilt trail in Tongass National Forest, the nation’s largest. Rates for the cruises begin at $3,989. Complimentary shore excursions that range from adventure activities to cultural experiences are included in all of the company’s cruises. In addition, local naturalists and Alaska Native guides conduct onboard presentations on the rich culture, flora and fauna of the region. Alaskan Dream Cruises also renovated both of its ships to welcome guests in time for the new season. Its 42-passenger Alaskan Dream, formerly the Executive Explorer, was redone with new carpet and paint, closets were added in passenger cabins and the forward lounge was revamped. The Admiralty Dream, formerly the Spirit of Columbia, was give a new, lighter color scheme in the cabins and public areas, as well as new carpet. The forward lounge was redesigned to give guests more space to relax and connect with each other.